If you come for an overnight stay in our home, you will find a collection of books on the bedside table. From travel to photography to short fiction. I plan to buy a second copy of the cookbook I’m sharing today, it’s a perfect addition for guest reading. I love imagining family and friends flipping through the pages of this book with a cup of tea, reading recipes and stories from the author’s health journey. Earlier this week her second book hit bookstores, A New Way to Food. I have been cooking from this cookbook for a few weeks now. I reached to wish her much success and see if she had time to answer a few questions. This cookbook includes a wonderful variety of recipes, kitchen/pantry knowledge, and personal storytelling. How is this book different from your first? My first cookbook is the exact opposite of this cookbook. It's called "Food Give Love" and it's filled with mostly indulgent food gifts. I love that book so much but I identify more with my new book, "A New Way to Food." It's the food I eat all the time. It's filled with vegetables and that's how I love to eat everyday because veg makes me feel so good. This new book also is radically vulnerable, I put many of the tough topics of my life on those pages. Looking at your website I see that in addition to being a writer, you have an online shop, are opening a store in Boston, and are a Creative Business Coach. All of this must keep you busy! Can you share a ‘perfect’ work day with us, to give new entrepreneurs some insight from a seasoned business owner? I would love to hear how you bring everything together and any tips you have for work/life balance. I am very fortunate in that I get to design my days right now. Once my first space opens, I'll redesign them again. Currently, the perfect day includes quiet early morning time for a yoga class or hot cocoa (or whatever centers me on that day). I like to write in the morning, too, but I typically divide my day up into two hour segments devoted to either my writing work, my shop work, or my coaching work. I always take a lunch--if I forget to eat, I'll just eat more later. And I prefer to cook dinner, as it's relaxing for me and a nice way to reflect on the day. I try to spend some part of the day reading something because it's become a form of meditation, another way I stay centered. Thank you for being so candid with your food journey. I’m thrilled knowing you see yourself as worthy of the very best foods! What food would your younger self be shocked to hear you love eating today? My younger self generally wanted to try everything. But she hated rice, because we ate it everyday. She'd be so delighted to see that I reinvented rice in a such a way that I enjoy it immensely now. It's both a memory from childhood and something fresh and new. How long have you lived in the Boston area? I went to college here and then moved away. I returned to the city in 2000 and have been here ever since. My husband is Boston born and raised. Favorite season: Boston shines in the fall. Very little compares to a walk through Harvard Yard when the leaves start to fall. The energy and color is electric. What are you reading now? The Power of Now (again) and A New Earth, both by Eckhart Tolle. I'm doing a lot of consciousness study. I just finished Joan Didion's The Year of Magical Thinking and that helped me process some of the grief around my mother's death (in summer 2017) considerably. A book you plan to read: On my list right now, Small Fry by Lisa Brennan-Jobs, Radical Acceptance by Tara Brach, and The Dreamers by Karen Thompson Walker. Name someone you would like to meet for coffee: My mother, one last time. Where was your last vacation? I was in Florida in November, but it was for family stuff vs fun. My last trip just for fun was in Vermont last summer. Best way to decompress at the end of the day? A little zoning out in whatever suits me that day: yoga, reading, cooking, or TV. 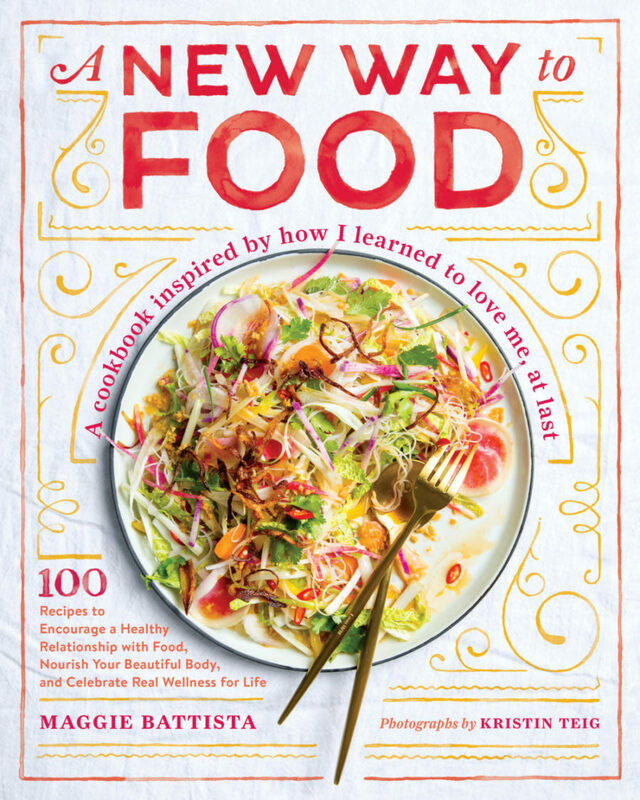 A New Way to Food is a nourishing cookbook with heart that will guide you to a new way to eat. Gain the inspiration and motivation to make healthy eating work for you, and discover ways to make wholesome organic ingredients permanent fixtures in your kitchen. The over 100 recipes here cover breakfasts, quick lunches, and nourishing dinners, and offer healthy updates on comfort foods and date night dinners. With a focus on plant-based eating, some meat dishes are also included. Note: I received a copy of this book for review from Roost. I love so much about this cookbook. From the gentle reminders/guidelines for good health to the seven ways to eat (with intention, beauty, in small batches, quality, sustainability, valuing tradition & innovation, and supporting small businesses). A lot of the recipes care for small batches, which is perfect for my small family! Most of the recipes included are vegetarian but are easy to modify for different dietary needs. I’m always cooking for an almost Vegan and a Carnivore, so this is important.